If you love this magical dessert, you have been to Thailand and probably savoured it in a hectic street scene with a plastic spoon and big smile on your face. It’s one of those experiences that etches itself on your memory, your first taste of sticky coconut rice is not easily forgotten. The very mention of this desert and I’m weak at the knee; one foot in dessert heaven, its full of unspeakably good sweet stuff and awesome flavour combos. As you may gather, I quite like this dish, it’s up there with my top desserts of all time (ever) in the world. I’m not a huge dessert fella, but sweet coconut rice topped with mango is something I’d swim to Thailand to try again. Jane brought it all the way to the Beach House and it was a very pleasant surprise. 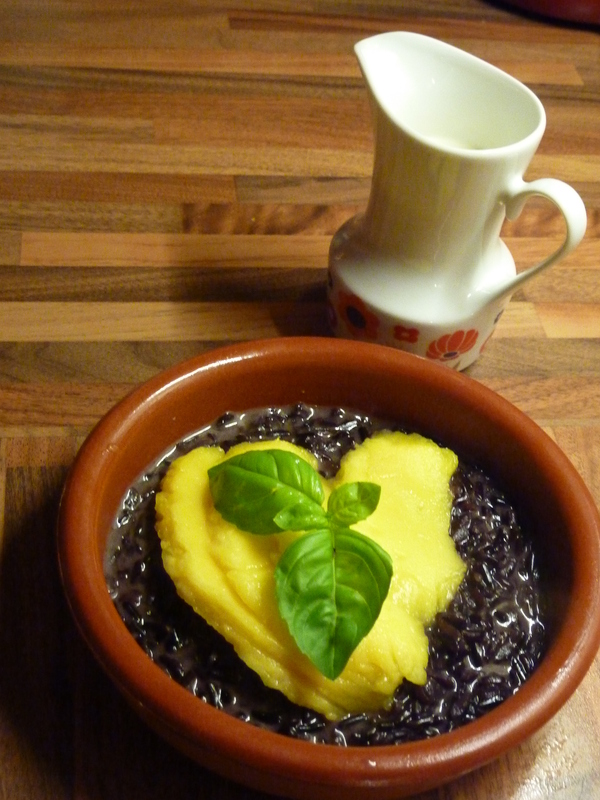 Jane made this ‘Forbidden Rice’ for one of our date nights (in). We are some of the luckiest folks you’ll ever meet and get much good luck/ news/ people crossing our paths and we felt like celebrating it all. I opened something fizzy and Jane disappeared into the bowels of the Beach House Kitchen to work her culinary magic spatulas, and what a feast we had. The Corn and Coconut Korma (recipe coming soon) was something to write home about (even though we were already home) but the dessert…………..I do a lot of the cooking in the B.H.K. and I also work in a kitchen for my sins, so to have a dinner presented to you with such care is a recipe for a magic night. Purple rice (sometimes called black rice) was deemed so special, fragrant and nutty, it was only served to emperors in ancient China, hence the ‘forbidden’ moniker. It was also popular in the fascinating Indian region of Manipur, where it is still served on very special occasions to much fanfare. It is believed that all of the strains of this rice lead back to the Manipur region. It is a glutinous rice and is grown in many different countries now, it is exceptionally nutritious (see the Foodie Fact) and has a distinct, full flavour. This rice also makes for a very funky porridge. The only problem is getting hold of the stuff, the real deal is hard to find. Jane picked some up in Glastonbury, which is the heart of all things obscure and nutritious foodstuffs within the UK. I imagine if you live in certain pockets of California it grows on trees there! But generally, it may take a while to track down. Our advise, persevere and bring this dessert into your life. Of you can’t get black, go white jasmine instead. This is an easy dessert to make and is perfect for when you fancy adding something a little exotic to proceedings; mango and coconut are a legendary pair and the coconut pouring sauce, quite literally, tops it off. We had some pouring sauce left over and its been making cheeky appearances on all sorts of things, mainly bowls of muesli. You may like to add a little jasmine thai rice to the mix, it turns a wonderful purple colour when combined with the purple/black rice. A word on coconut milk: there is some real rubbish out there. We have managed to find a little sustainable Sri Lankan project that makes the finest coco milk, it cannot be compared with the stuff you’ll find clogging most supermarket shelves. 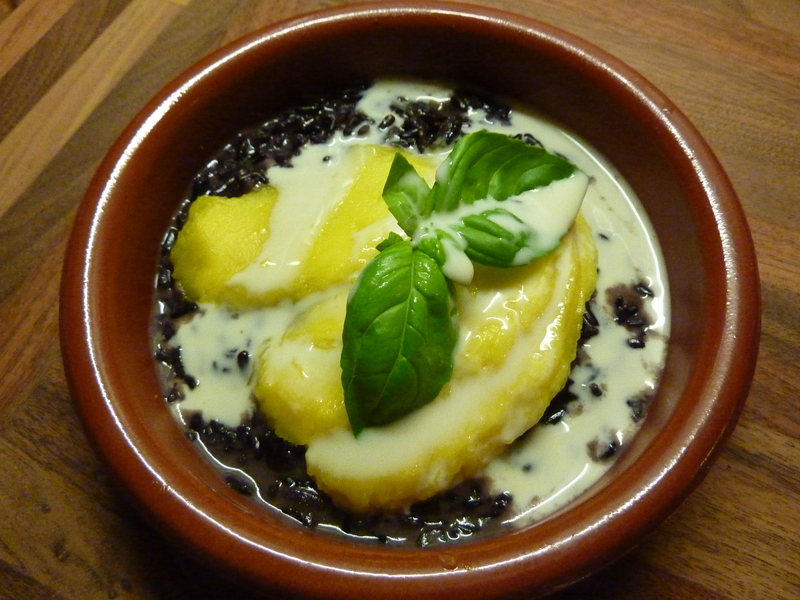 Soak black rice for four hours or overnight to get nice and tender. Cook all rice in a saucepan, cover with plenty of water and bring to a boil, simmer for 30 – 40 minutes or until tender but still with a little bite. Drain, keep warm. Pour coco milk (make sure you get all the cream from the bottom of the can), sugar and salt into saucepan and bring to boil, simmer for 5 minutes, stirring almost constantly. Reserve a cup for pouring at this stage. Add your rice to the saucepan, heat again gently to a boil, then simmer for 10 mins until it thickens. Check sweetness. Cut mangoes, this can be quite a fiddle, so heres a little example of how its best done by Peggy Trowbridge Filippone (we loved the name). This will give you cubes, for the thin slices, just take off the skin at the cubing stage and slice thinly. Any questions, we are here to help on the mango hotline, Wales. Next up toast your coconut in a small frying pan, medium heat for 5-8 minutes will do and this can be done well in advance, although warm is better. In lovely shallow bowls (small servings are best as this is a very rich dessert), spoon in your purple rice, lay on your slices of mango (fan shapes look brilliant here) and offer the pouring sauce in a small jug. The general sweetness of the dish will be enough for most. Sprinkle on your coconut and basil leaves and serve warm and immediately. You’ve seen the pictures, you’ve heard me get all excited, you imagine the flavours……..you know you’ll love it! Purple/ black rice contains all of the 18 amino acids, which means that technically you can live on the stuff. Great for dessert islands (small joke there)! It is also high in iron, zinc, copper, caroten and several great vitamins. It also contains anthocyanins, which make it black and are also found in blueberries and peppers. This chemical mops up bad molecules and is a poweful anti-oxidant. Purple/ black rice has also be touted as the new superfood against the big C (cancer). Two tunes this time from Beach House radio and both relevant to this incredible dessert. Deep Purple ‘Child in Time’ for the deep purple of the rice and because it reminds me of the dawning or rock music in my world (I was around 10 years old in the back seat of a car when it hit me like bolt, you can wail and not be told off! IT’S ONLY ROCK AND ROLL. If I could sing like Ian Gillan, I’d happily forgo my forbidden rice. and a shaky clip from one of my favourite music bars in the world, the Adhere Blues Bar (just of the infamous and rubbish Khaosan Road) in Thailand (queue more wailing with a Thai accent). I’m just back from Thailand, so the moment I saw this post, I had to click it. Do you think it is easy to make it at home? Very easy! A little boiling and you’re off to a flier. Happy sweet dayz. P.S.The music is a nice touch .Thank you . I love mango sticky rice, and I’ve never had it with black/purple rice. Must try it. I live in the States. Do you know of any good brands of coconut milk I could try? Costco recently began selling purple/black rice and at a reasonable price. Will be buying soon! !